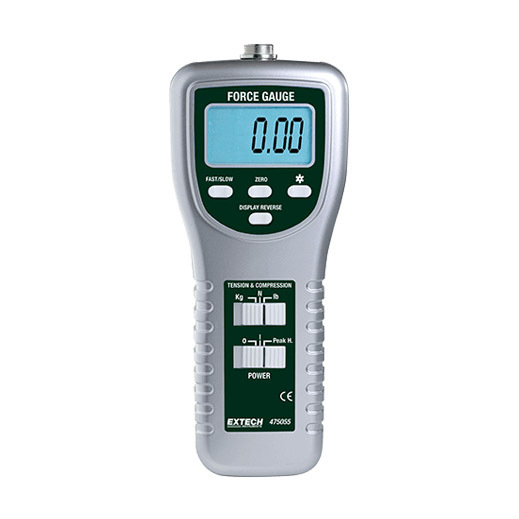 475055 is a High Capacity Force Gauge. Measuring ranges from 0.05 to 100-kilograms, 0.05 to 220-pounds, 0.2 to 980 Newton. Basic accuracy of 0.5-percent. Tension or Compression, Peak hold and Zero functions. Positive/Reverse display for easy readability. Large LCD with back light feature. Complete with tension and compression adaptors, 6 AA batteries and case.